The weekend kicks off on Friday, May 3 with assembly in Walton Auditorium. 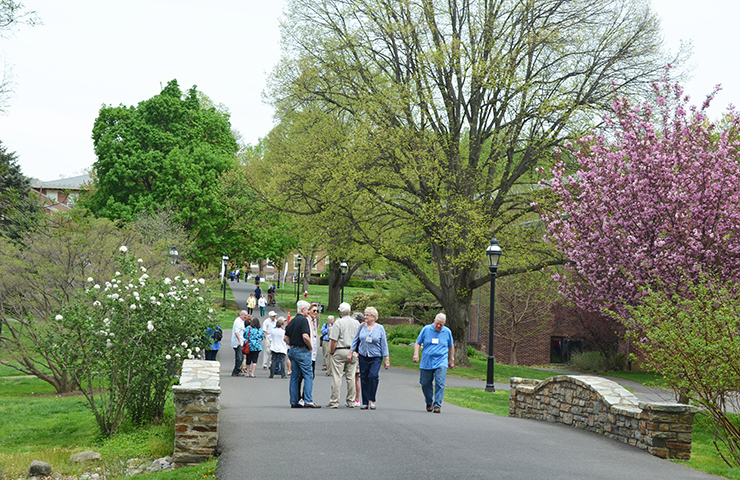 George School warmly welcomes alumni back to campus for Alumni Weekend, which will be held from May 3–5, 2019. Class years ending in 4s and 9s will celebrate their milestone reunions this year, but all alumni are welcome to join the fun. The weekend kicks off on Friday, May 3 with assembly in Walton Auditorium. In the afternoon, alumni can go back to class and sit in on IB Global Politics, AP Physics, or Photography. The day ends with an all-alumni Welcome Reception from 7:30 to 9:00 p.m. in the Mollie Dodd Anderson Library. Start your Saturday at 8:00 a.m. with the Alumni Weekend 5K on the cross country course. The race will be followed by a memorial meeting for worship, tributes to retiring faculty members, and a welcome address from Head of School Sam Houser. After buffet and picnic luncheons, alumni can choose their own George School adventure, with activity options such as ceramics with Judy Bartella, a gathering of the Cynthia Crooks Carpenter ’47 Alumni of Color Network, campus tours, and more. There will also be an alumni soccer game on Cougar Field and a community carnival with live music on South Lawn in the afternoon. Reunion class parties and dinners are planned for Saturday evening off campus. The weekend concludes on Sunday with meeting for worship and brunch. Registration, accommodation information, and a detailed schedule are available online.